From the perspective of an eagle or an astronaut, there are no boundaries or borders on our home planet. Countries are contrived by humans, and men stake out their territories. The real boundary is the Earth's atmosphere, below which thrives the only life we know of in the universe. All humans live on common ground. This weekly blog post and its host website cover a wide variety of Fred Montague's environmental commentaries, gardening topics, and wildlife/art activities. Please browse the website and the blog archives for topics you are interested in. Garret Hardin (1915-2003) was an ecologist who taught at the University of California-- Santa Barbara. He is known for his writings on the tragedy of the commons, lifeboat ethics, and a human population small enough that all might enjoy a diet of steak and wine, among many others. In 1984 at the Annual Meeting of the Society of American Zoologists he presented his paper "Human Ecology: the Subversive, Conservative Science." This included a list of what he considered to be the foundation stones of the science of human ecology. The 8th (of 12) was population growth ultimately makes democracy impossible. He supports this statement as follows: "Easy communication is the sine quo non for an enduring democracy. All communications functions are inherently affected with diseconomies of scale, since (for every well defined communication network) the burden created by the communication of n people increases as the square of n. This burden expresses itself in information overload, which leads to misunderstandings, social pathologies, and (ultimately) the acceptance of a totalitarian regime as the least of the evils available to an overpopulated political unit. In the face of unlimited population growth the word 'democracy' can be retained, but not in fact." Hardin's thoughts 32 years ago seem validated by the events of today. The global human population has increased from about 5 billion in 1986 to 7.4 billion in 2016, an overall increase of 48%. Today the human population is increasing by nearly a million people every 4 days and is predicted to reach 9.8 billion by mid-century. If this growth materializes, it will happen on an Earth increasingly depleted of essential resources, both in quantity and quality. Population growth (in less-developed countries), increased resource use and environmental impact (especially by those in more-developed countries like the U. S), and common sense, predicts that the additional 2.4 billion people in 2050 (added to today's population) will find us all ever more crowded and competing and confronting each other. This, along with Hardin's "information overload," will pose serious challenges to the survival of democracy and freedom worldwide. And Hardin didn't consider the effects of disinformation. In 1992, building on Hardin's idea, I created this Fox Sense graphic. With population increase, there comes a point where the contributions of more people (human resources) begins to be overwhelmed by the competing interests and impacts of the masses. Then we will need more laws and bosses and stop signs (less freedom) to keep us out of each other's way. Perhaps the U. N. could consider enacting a global "Endangered Freedom Act." The essentials of such an act would include population stabilization, less consumption, less resource depletion, less environmental degradation and more environmental restoration by everyone. This week's post: Now, more than ever, let your voice be heard. We, in the conservation, environmental, and social justice movements, are fortunate to have a host of effective organizations to keep us informed and to give us a chance to join others via email petitions in communicating with elected representatives, corporate executives, and government agencies, etc. In addition, there still is great power in the form of a personal, cordial, hand-written note. Consider sending these "Fox Sense" notecards to friends, neighbors, elected representatives, and others to politely communicate your concerns and hopes. There are eight cards (with envelopes) in each pack, and each card has a different environmental or political message. My thought is that you simply write a polite "thank you for your service" sentiment, sign the card and include your address (if writing to a legislator, for instance). Your message will be read, and the fox's message may be considered. This is just a suggestion, but in this particular time, any action is better than doing nothing. All eight messages appear below. These notecard packs are $12.00 each ($1.50/card and envelope). If you order 4 packs, you will receive a fifth pack with my compliments. You can also use these cards as bumper stickers for your desk, bulletin board. or refrigerator. The latest set of notecards from Mountain Bear Ink consists of 8 different environmental and political comments from the "Fox Sense" series. Each pack has 8 notecards with envelopes. $12 per pack. Available at December 2016's holiday art sales (see last week's blog post, 11-30-2016) and will be available soon through the Mountain Bear Ink website. This Week's Post: Holiday Art Exhibits and Sales Events. Please join us at one or more of these upcoming events. Join us in two weeks for the annual Red Butte Garden Holiday Open House and Sale, Saturday & Sunday, December 3rd and 4th, 2016. Open house hours are 10:00 am to 5:00 pm each day. Free admission. Fred will be selling his nature pen-and-ink artwork, woodcuts, and books. Hope to see you there! More info. Fred will be selling his nature artwork at the Saint Mary's Catholic Church Holiday Bazaar this weekend, November 19th and 20th, 2016. Get an early start on holiday shopping and shop for unique and distinctive gifts, including Fred's woodcuts, prints, books, and notecards. See info and links below. Hope to see you there! Each year at this time I view the Population Reference Bureau's annual "World Population Data Sheet." Of particular interest to me is the trend over the past 15 years or more to increase the Bureau's projection for the size of the human population in 2050. BR = birth rate (# of births per 1,000 people). DR = death rate (# of deaths per 1,000 people). NI = natural increase (growth rate of the population). The just-published "2016 Data Sheet" projects the 2050 population to be 9.869 billion. The PRB states: "the projected populations [are] based on reasonable assumptions of the course of fertility, mortality, and migration [relevant only for individual country projections]. Projections are based on official country projections, series issued by the U.N. or the U.S. Census Bureau or PRB publications. Since 2000, these projections have been updated to show the potential addition of about 0.83 billion more people than the 2000 projection of 9 billion. If these projections are accurate, by 2050 there will be 2.4 billion more humans than today. This total population increase of nearly 32% will occur in the next 34 years. Future posts will address some of the challenges and opportunities this unprecedented population phenomenon offers. Here's a page from my hand-lettered wildlife textbook titled Wa-Maka-Skan: Fundamentals of Wildlife Ecology and Conservation. This page introduces students to the eight species of wild canids on the North American continent. See also the blog post from December 26, 2012. The first woodcut I published is the "Young Wolf." In 1997 I experimented with printing woodcut images on my 1913 Golding letterpress after having printed pages for my artists' books and letterpress prints. The woodcut images are in contrast to my previous drawings and prints. Those incorporated much more fine-line detail. The woodcuts, some of which are nearly silhouettes, emphasize shape, negative space, and hints of detail. A professor of visual psychology remarked to me at a recent art exhibit that my woodcuts were striking in their high-contrast (black/white) presentation and their subtle hint of important information. In what I took for a compliment, he concluded by saying they conveyed important information-- just as a highway warning sign. The "Young Wolf" print is a signed, limited edition of 88. The image is 8" x 5.5" and I mat them in white for a 14" x 11" frame. The edition is about half sold-out. My latest woodcut, "Snowy Owl," featured in the July 20th blog post, is one of four in an owl series that I hope to complete in the next three months. Celebration of the Earth's biological diversity is one of the goals of the art and writing projects of Mountain Bear Ink. My drawings, woodcuts, and handmade books are designed to foster an awareness of the amazing variety of organisms on Earth, the essential services they perform, and their current status in the shadow of an ever-increasing human population. Consider becoming familiar with another related website-- the Biodiversity Heritage Library. This site archives scientific reports, surveys, and other materials related to our planet's biological entities. 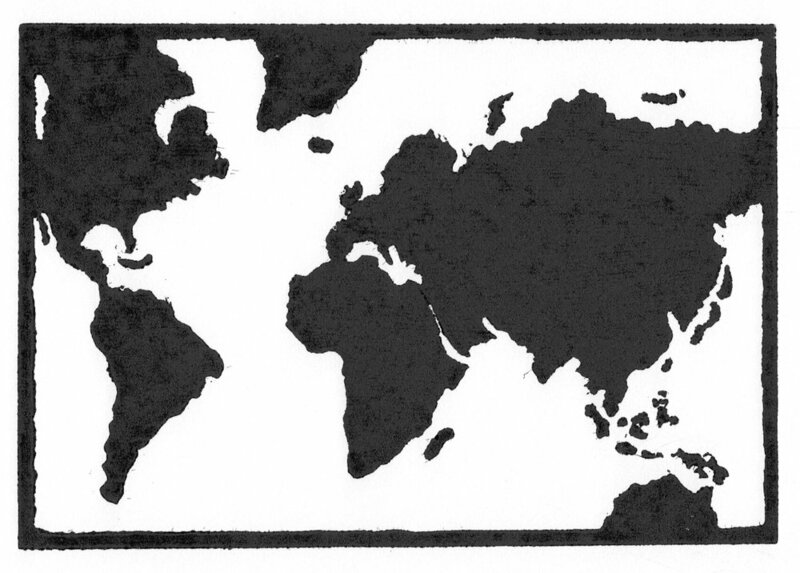 I am particularlyimpressed by the organization's fascinating collection of illustrations from all over the world. The BHL's mission: "The Biodiversity Heritage Library improves research methodology by collaboratively making biodiversity literature openly available to the world as part of a global biodiversity community." Posted below are two examples of pages from the BHL collection. Fred will be displaying and selling his nature drawings, prints, and notecards at the Park Silly Sunday Market (Park City, UT) this Sunday, September 11th, 2016, from 10:00 am to 6:00 pm. Hope to see you there! This week's post consists of a copy of a letter sent to the United States Congress earlier this summer from 31 of our preeminent scientific organizations. The letter represents the majority opinion of the thousands of members of the entities listed as signatories. The scientific community overwhelmingly agrees that unprecedented rapid climate change is happening and that human activity is the principal cause. This community of scholars also includes the several thousand scientists contributing to the Intergovernmental Panel on Climate Change (IPCC) assessment reports and the Millennium Ecosystem Assessment. There has never been a challenge confronting humanity that has such widespread global scientific support. There are many reasons why global climate change poses significant challenges for humans. The pages reproduced below are from my hand-lettered textbook Wa-Maka-Skan: Fundamentals of Wildlife Ecology and Conservation. Figure 2 on the page below ("Major Biomes of North America") shows the observed link between two major climate features, mean annual precipitation and mean annual temperature, and the occurrence of major vegetational communities. As our industrial civilization changes the climate, the new temperature and precipitation patterns become less favorable for biomes as they are currently distributed. Climatologist Stephen Schneider says, 'biomes find themselves stranded in the wrong climate.' The existing vegetation will die, beginning on the southern and northern edges of its range, and different plant communities will begin to emerge. Even with rapid climate change, this transition will take hundreds of years in most cases. These biome shifts have widespread consequences for agriculture, forestry, groundwater recharge, river flow, biodiversity and a host of other taken-for-granted benefits that we receive from a relatively stable Nature. Grassland areas become warmer and drier as they shift toward desert communities. This is important for humanity since our major agricultural regions occur in grassland biomes. Shifting agriculture northward (in the northern hemisphere) as grasslands migrate north into formerly forested areas is problematic because the forest soils (that developed under forests) are less well-suited for the crops we depend on. In ecosystems (and even in engineered systems), change is destabilizing. My generalized biome map on the second page shown below will have to be revised in the year 2500. Recent legislation regarding labeling the presence of genetically modified organisms (GMOs) in commercial food products represents a confusing compromise between consumer preference for "plain-and-simple" labels on food products and the commercial food industries' preference for no labels at all. As a wildlife biologist, I side with the consumers' preference. We should be able to identify and choose products whose production and processing affect both human health and the "health of the planet." If consumers can easily choose, the referendum on the acceptance of GMOs can be made by you and me. I have outlined in a previous post and in chapter 13 of my little hand-bound book Garden Notes: Thoughts on Gardening, Ecology, and Sustainability several concerns regarding industrial agriculture based on genetically modified organisms. Don't be confused by the food labeling controversy. The way to know with a reasonable assurance that your food does not contain GMOs is simply to purchase only food that is labeled "USDA Certified Organic." There are other conditions, but these are the most important. If a food product is not labeled "organic" assume that it is a genetically modified plant or animal that has been grown with human sewage and that it contains non-food chemicals and that it has been irradiated. Additionally, you could grow some of your own food, and you can support local growers you know and trust. Some farmers (and commercial gardeners) are growing foods organically but have not yet been certified (or cannot afford to be certified). They need your encouragement and support. At a farmers' market simply ask the grower face-to-face. We are fortunate to have the USDA Organic program (see the current regulations of the program). Be prepared to defend the Organic Certification principles.